The results presented by the body charged with overseeing the tax system are essential to the fulfilment of the objectives established by any government. Therein resides the source of revenue, in the form of taxation that allows to meet any expenditure incurred. When this body proves to be ineffective, it can compromise fiscal policy (Faría & Yucelik, 1995), since it has direct bearing on the tax system’s efficiency and, therefore, on its capacity to produce revenue resulting from collection (Rubio, 2010). The success of any tax system is dependent upon the administration charged with its implementation (Lasheras & Herrera, 1991). Governments have opted for the introduction of new taxes and for an increase in tax rates in scenarios where such an action may have proved unnecessary, had greater efforts been made to ensure an optimal organization within the management of the tax system. Therefore, a tax system should not be considered solely in terms of taxation structure or the quantification of taxable events, but it must also be approached from the perspective of the efficiency and efficacy of the tax administration charged with overseeing it. The tendency towards offsetting deficit by incrementing fiscal pressure might be substituted by a more rigorous control of the management of the tax system, increasing its efficiency, while reducing the incidence of fraud (Rubio, 1996; Ruibal, 2008). Over the course of the last decade, the organization of the functions of the public sector has undergone considerable changes (OECD, 2008). The tax administration, swept along by this reformist tendency, created quasi-autonomous bodies to achieve certain improvements in terms of collection, the provision of services or selffinancing. Such structural modifications gave rise to various forms of carrying out the task of overseeing taxation. More specifically, four categories of organization can be established: a) a single directorate within the framework of the Ministry of Finance or a corresponding Ministry; b) several directorates within the framework of the Ministry of Finance or a corresponding Ministry; c) a unified quasi-autonomous body that is a dependency of a Ministry; and d) a unified quasiautonomous body overseen by a governing board. Table 1 evidences the predominance of unified quasi-autonomous bodies within the OECD cou ntries and additional countries that were studied. Attention should be drawn to the fact that approximately 50% of the OECD member countries have created quasi-autonomous bodies. Source: Authors' elaboration. Data obtained from OECD 2007. Given the importance and singularity of the functions assigned to the Agency, the legislature saw the need to devise a specific legal status, aiming to promote greater agility and operational efficiency. The Agency model is well established and the evolution of the Spanish tax administration has sought to achieve greater integration between the strategies of international and national tax administrations with the maximum amount of shared information, as well as to especially strengthen preventive actions (Catalan, 2014). 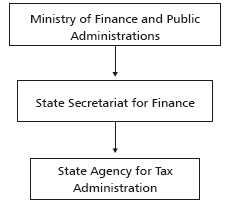 Thus, it is constituted as a body governed by public law that is a dependency of the Ministry of Finance and Public Administrations, through the State Secretariat for Finance (Figure 1). Within the AEAT's sphere of operation, a distinction must be made regarding whether its actions have a centralized or a peripheral focus. Central AEAT services are essentially based on an organizational model ordered into operative functional areas, devised around six departments: tax management, financial and tax inspection, tax collection, customs and excise, IT department and the department of human resources, complemented by several support structures, such as legal service, financial management service, fiscal and statistical studies service, and planning and institutional relations service. 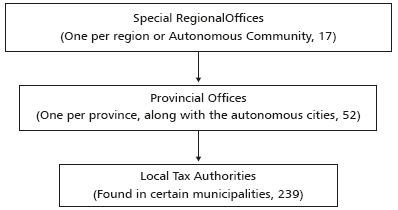 The peripheral or territorial services are made up by 17 special regional offices, one in every Autonomous Community, 52 provincial offices,3 which are the focus of this paper, incorporating 239 local tax authorities, found in a number of municipalities, 36 of which are customs offices. The peripheral structure is illustrated in Figure 2.
Review of the empirical literature The study of efficiency within the public sector is a controversial subject, given the difficulty of measurements and the multitude and heterogeneity of its constituent sectors: justice, health, citizen security, education, tax administration, among others. Nevertheless, analysis of the efficiency of tax administration, in spite of the difficulty it presents, proves necessary in order to reinforce a sense of fiscal commitment among citizens. This is due to the fact that efficient management on the part of tax administration legitimises its activity, promoting voluntary compliance among taxpayers and encouraging them to continue financing the public sector with confidence via revenue resulting from taxation (Gale & Holtzblatt, 2000). The need to determine and measure the efficiency of the body charged with overseeing the Spanish tax system has led us to undertake the analysis of AEAT. This paper seeks to provide an approximate value for the relative efficiency of the regional offices that make up the tax administration system, employing a series of variables that are considered essential to its correct operation. While the efficiency of tax administration is one of the maxims put forward by Adam Smith (1776) in his famous work addressing taxation, research on efficiency within tax offices remains relatively scant, due to the difficulty of accessing data, the limited amount of data available, and the confidentiality of such data in the majority of countries (Barros, 2007; Hasseldine, 2010; Onrubia, 2010; Fersund et al., 2015). This prevents us from determining whether tax administration achieves universal compliance with the tax system, or whether, on the contrary, it warrants certain reforms. To put it into context, a literature review on the analysis of efficiency and productivity within tax offices reveals that the published studies employ frontier techniques: stochastic frontier analysis and, primarily, data envelopment analysis (hereinafter DEA). Table 2 indicates the references and the most important characteristics of the empirical studies on efficiency within tax administrations. Source: Authors' elaboration based on the literature reviewed. Notes: 1 BA: bootstrap analysis; DEA: data envelopment analysis; FDH: Free Disposal Hull; MI: Malmquist Index; SFA: stochastic frontier analysis; WA: window analysis; 2nd: second stage analysis. Thus, productive efficiency in the larger Indian states was analysed over the period between 1980 and 1993 via stochastic frontier analysis (Jha et al. 1999), data envelopment analysis and the Malmquist Index (Thirtle et al., 2000). The work carried out by Moesen and Persoon (2002) analyses efficiency in 289 Belgian tax offices in 1991 using Free Disposal Hull and DEA. In the case of tax offices in Portugal, Barros (2005) employed a stochastic evolution model combined with a DEA approach, while Barros (2007) evaluates the technical and allocative efficiency of the same offices over the 1999-2002 period. Similarly, Fersund et al. (2005) apply DEA and the Malmquist Productivity Index to the analysis of tax offices in Norway between 2002 and 2004. In turn, Lewis (2006) studies inefficiency in 224 local tax offices in Indonesia employing stochastic frontier analysis with a cost frontier approach. More recently, Katsahari (2010) uses DEA to estimate efficiency in tax offices in Greece from 2001 to 2006, with the aim of determining those that maximized tax collection levels. Ruy and Lee (2013) use DEA to estimate the aggregate efficiency scores of six tax jurisdictions in Korea for each of the 14 years between 1998 and 2011. And, finally, Alm and Duncan (2014) use data provided by the Organisation for Economic Co-operation and Development for the period 2007-2011, together with a novel three-step estimation strategy that utilizes DEA and SFA in order to determine the relative efficiency of tax agencies in their use of inputs. In Spain, attention should be drawn to the work of González and Miles (2000), who analyse the efficiency of 15 regional Spanish tax offices in 1995 via DEA, employing a bootstrap technique. For their part, the study by Esteller (2003) measures and explains the level of technical efficiency in the administration of taxes collected from the Autonomous Communities in 1992 and between 1995 and 1998, via the estimation of the stochastic frontier. possible social cost. This paper is concerned with the concept of technical efficiency, given that analysing other types of efficiency entails the need for awareness of market prices or, where necessary, social costs, values that remain largely unknown in the case of the public sector. The existing techniques to measure efficiency within the public sector can be grouped into various types. A distinction can be made between parametric and non-parametric methods, while statistical methods can be employed or rejected when estimating the frontier that, ultimately, may be specified as stochastic (random) or deterministic. This paper employs DEA methodology, based on the article by Charnes et al. (1978), set up as a non-parametric, deterministic approach that allows us to obtain a measurement of relative efficiency between regional offices, understood as decision making units (DMUs), in order to identify those that present optimal performance when compared with the rest. This methodology entails priorities that make it particularly suitable for the measurement of efficiency within the public sector, in which sense attention might be drawn to the following:4 it does not make assumptions about the functional form in the production function; the model accounts for inputs and outputs of a multi-dimensional nature; it is a flexible model that places few restrictions when defining production as a whole and its corresponding frontier. In view of the peculiarities of the AEAT production process, an output-oriented two-stage DEA methodology was considered appropriate, in keeping with the BCC model (Banker et al., 1984), as we believe that priority is placed within the AEAT management on the objective of concerting efforts to achieve the greatest possible output with the inputs in question, leaving little room for manoeuvres in terms of adjusting inputs. The two-stage method involves problem solving within each unit. In the first stage, the objective is to determine the greatest proportional increase that would be needed within the outputs in order to generate a situation where each DMU under study achieved the efficiency of the Farrell-Debreu measure, or weak-form efficiency. In the second stage, based on the optimum obtained in the first stage, outputs are adjusted and surplus variables maximized in order to radially shift the projected point in the first stage, which complies with Farrell's efficiency measures (1957), to a point regarding efficient envelopment where it complies with the Pareto-Koopmans optimal value, or strong-form efficiency. Thus, the maximum possible increase to outputs within a DMU can be calculated as the sum of a radial component and the corresponding surplus variable. Data corresponding to 2012 were analysed, since it was the most recent year with available data when writing this paper, due to the backlog (the re is normally a lag of three or four years) in the publication of data on the part of the Ministry of Finance and Public Administrations. The selection of inputs and outputs is of vital importance and, in many occasions, highly complex, given that it requires the prior clarification of the objectives established by each DMU, which gives rise to the need to select the inputs and outputs that best represent the activity to be studied. In this case, three inputs were taken into consideration: 1) current expenditure in goods and services (EXPEN), addressed in chapter II of the AEAT expenditure budget and required for the effective application of the tax system; 2) the number of tax returns (TAX_RET) processed in each one of the offices, identifying a return per taxpayer and tax;8 and, 3) personnel numbers (STAFF) in the employ of each one of the offices under analysis, taking in both contractual staff and civil servants. A number of these inputs have also been selected by other authors when analysing efficiency within their respective tax administrations: Barros (2007), Esteller (2003), Hunter and Nelson (1996), Katharaki and Tsakas (2010), Maekawa and Atoda (2001), and Moesen and Persoon (2002) included both the EXPEN and STAFF inputs, while all included the STAFF input. The main contribution of this paper consists of the analysis of an output that, up to this point, has not been employed: revenue resulting from tax assessments (hereafter IAL9) was considered as output, representing the revenue collected by various offices as a result of the effective application of available resources, employing all coercive measures at their disposal. Previous studies have employed other concepts of tax collection (Barros, 2005; Esteller, 2003; Hyun et al., 2001; Jha & Sahni, 1997; Jha et al., 1999; Katharaki Tsakas, 2010; Maekawa & Atoda, 2001; Thirtle, 2000), which, in the case of Spain, be comparable to the Tax Revenue Allocated to the Budget (ITAPE10), representing revenue obtained automatically, without direct action regarding the resources employed by each office, in the form of self-assessed tax contributions in most instances. This paper also takes into account variances in fiscal capacity between offices, conditions the output obtained in each case (Esteller, 2003), to which end the output weighted by the GDP per capita (hereinafter GDPpc) of the respective province in to average GDPpc at national level. Thus, two models are presented: in the first the output (IAL) is calculated without GDP weighting calculated without GDP weighting, and in the second, the output (IALc) is adjusted in accordance with GDP. The ratio is lower than 1 when GDPpc is higher than the national average, and greater than 1 when the contrary is tru. The dresciptive statics of the inputs and outputs employed are detailed in Table 3. *The "EXPEND" input and the output for model 1 and 2, "IAL" and "IALc" are expressed in thousands of euros. ** The remaining inputs are expressed in units. First, in order to analyse the correlation between model 1, which considers output without adjusting for GDP, and model 2, which does adjust IAL in accordance with GDP, the Spearman test was employed (Table 4). The results indicate a high correlation between the tow models, whereby the adjustment of the output in model 2 (IALc) offsets variances in fiscal capacity among the 47 offices analysed, although their ranking varies little in accordance with the degree of relative efficiency achieved. Comparing the efficiency ranking obtained for the DMUs analysed in each model, the office that undergo the greatest change in ranked position is Zaragoza (with a fall of 13 positions, although it remains efficient irrespective of the model employed). This drop in ranked position is justified because Zaragoza is a province that presents a GDPpc that is higher than the national GDPpc, positioned as the 6th province ranked according to the highest GDPpc, thus weighting the output by GDP gives rise to this descent within the rankings. At the opposite end, attention should be drawn to Cáceres y Badajoz (both offices are located within the Autonomous Community of Extremadura), as the provinces that undergo the greatest change within the rankings in terms of ascending, improving their positions by 42 and 18 places, respectively (although Badajoz remains inefficient irrespective of the model employed; Cáceres, however, becomes efficient by applying model 2). In contrast to the previous case, this improvement is justified by the fact that Cáceres and Badajoz present a GDPpc that is lower than the average. More specifically, Cáceres has the lowest GDPpc of the 47 provinces studied, while Badajoz occupies the 45th position, which justifies their somewhat dramatic rise through the rankings when output is weighted by GDP. As indicated above, DEA analysis allows us to determine the most efficient office compared to the other offices under study. The best practice observed is then employed to evaluate all the other practices, which explains the reference to relative efficiency (Charnes et al., 1981). On the other hand, an inefficient office proves to be inefficient precisely because there exists another or a linear combination of other offices that can produce the same output while expending fewer inputs, thus the former is forced to emulate the performance of the latter. Applying the BCC model to the variables under study we obtain descriptive statistics derived from the efficiency analysis for the two models employed (Table 5). Determining an average efficiency value of 1.520 for model 2 indicates that, in most cases, the offices could improve revenue resulting from tax assessments by 52%, evidencing clear room for improvement. Variance in the efficiency of units that depends on the model affects a limited number of provinces: it is the case of Cáceres, Jaén, Granada, Huelva, Cuenca, Zamora, Soria, and Almería. They become efficient when the economic dynamism of the respective province is taken into consideration, which is an entirely coherent result given that the provinces present GDPpc levels that are below average, thus they move from inefficient to efficient once output is weighted by GDP. From this point, considering only the analysis where the output was adjusted by GDP (model 2), as it is thought to provide a more faithful reflection of the true dimension of the output analysed, we obtain the efficiency results indicated in the appendix for each of the 47 offices under study. Of the 47 offices analysed, 21 were identified as efficient in terms of the Farrell-Debreu definition, or evidencing weak-form efficiency (Table 6), given that their efficiency results were equal to one; mo reover, as they all presented surplus variable of zero value, they proved to be efficient in accordance with the Pareto-Koopmans definition, that is to say, evidencing strong-form efficiency. Once determined which offices are efficient, it is possible to rank them according to the frequency with which these offices appear as a reference point for inefficient offices (Table 6). For each inefficient office, DEA allows us to determine a series of contrastingly efficient offices, which thereby form a reference group, the so-called peers, which means that they provide a reference point for improvement for the inefficient units. As Table 6 demonstrates, there are three offices that present clearly higher efficiency levels within the group of efficient DMUs: Córdoba, Barcelona, and Castellón, ordered from higher to lower frequency, providing reference point for inefficient offices on 18, 17, and 10 occasions, respectively. The provincial office of Córdoba can be considered as the global leader, a term introduced by Oral and Yolalan (1990) to draw attention to the unit within the sample that can be considered as presenting the best overall performance. As El-Mahgary and Lahdelma (1995) and Avkiran (1999) point out, the global leader is the efficient unit that appears with the highest frequency within the reference groups for inefficient units. The office of Barcelona appears at a frequency of 17 occasions, while the provincial office of Castellón appears as reference point on 10 occasions. The following 11 provinces appear at a frequency of 1 to 8 occasions, which calls into question their status as a model. In the case of the last seven provinces, though qualified as efficient, they never serve as reference point for any other office, which suggests that "either the efficient unit in question is only efficient within a very limited sector, due to a high degree of specialisation, or it possesses an Input/Output relationship that is highly unusual" (El- Mahgary & Lahdelma, 1995: 706). In parallel, we analysed the weights of each of the reference units (benchmark), determining the extent to which each benchmark within the reference group for an inefficient unit contributes towards the target values of this unit (Table 6), thereby providing a more faithful representation of the true intensity with which each benchmark inter venes in the construction of the corresponding inef ficient units. The results of the analysis of weights demonstrate that Córdoba is the office with the greatest weight (5.31) as a reference point for other units, followed by Barcelona, with a weight of 3.05; in the third and fourth position, there are the provincial offices of Málaga and Castellón, with weights of 1.39 and 1.28, respectively. The remaining offices present residual weights. Once the estimates of technical efficiency are obtained for the 47 offices under study, it is equally important to determine those offices that stand out for the opposite reason, that is to say, those offices that present the greatest degree of inefficiency. In this case, as the appendix shows, the provincial offices of Asturias, Lugo, Cantabria, Las Palmas, Palencia, Murcia, and La Rioja are those that prove to be the most inefficient when compared with their peers. It should be pointed out that four of these offices (Asturias, Cantabria, Murcia, and La Rioja) are located within Autonomous Communities with only one province, hence such offices are the most susceptible to improvement as a result of changes in the management. The second step, representing an important contribution of the present analysis, is to determine, via the surplus values obtained in the second stage, the possible increase in revenue resulting from tax assessments, if the offices in question display efficient behaviour. In this case, IAL might have risen by 21.6%; that is, if all of the DMUs had acted efficiently, this would have represented a rise of 1023 million euros in the average annual IAL over the 47 offices analysed. The efficient action of a tax administration does not only directly cause an increase in collection, but it also gives rise to a reduction in tax fraud, given a greater degree of voluntary compliance among taxpayers, who perceive a more efficient administration that pursues undeclared taxable events. Thus, in addition to increasing revenue resulting from tax assessments, an even greater increase could be observed in terms of voluntary contribution, in addition to its beneficial effects to any society that observes compliance with tax regulations, irrespective of the origin of the taxpayer. Tax systems should not be considered solely in terms of taxation structure or the quantification of taxable events, but they must also be approached from the perspective of the efficiency and efficacy of the tax administration charged with overseeing it, as a means of obtaining higher revenue resulting from taxation and a lower instance of fiscal fraud. This paper presents an analysis of relati ve efficiency among 47 territorial offices that form part of the Spanish State Agency for Tax Administration. This study was motivated by the present need to achieve higher volumes of collec tion via tax administrations, given the current high levels of public deficit. Our research indicates that improved efficiency within the offices that make up the body charged with managing taxes in Spain (AEAT) would entail an increase of 1023 million euros in revenue resulting from tax assessments (output), which would mean a rise by 21.6% in collection. This could offset the intensity of a collection policy focused on the introduction of new taxes and an increase in tax rates, or imply fewer cutbacks in public expenditure, with the ensuing political and social cost that this implies. Based on the output-oriented two-stage data envelopment analysis carried out, attention should be drawn to the fact that among the 47 offices under study, only 21 were identified as technically efficient. On average, taking into account the output weighted by the GDP per capita of the corresponding province in relation to the national average GDP per capita, it is found that the offices could have increased revenue resulting from tax assessments by 52%, which corroborates the premise that there is a great deal of scope for improvement, acting on those offices that prove to be inefficient in relation to those offices that present optimal behaviour. Among the offices that proved to be efficient, the provincial office of Córdoba must be highlighted as the global leader, representing the reference point for the greatest number of inefficient offices; moreover, if we take into consideration weights, understood as the intensity with which each efficient office intervenes in the construction of an inefficient office, Córdoba ap pears first in this sense too. At the other end of the scale, among the values calculated for technical efficiency throughout the entire body of offices that were studied, Asturias, Lugo, Cantabria, Las Palmas, Palencia, Murcia, and La Rioja bear parti cular mention as the least efficient. Finally, it is important to point out the difficulty entailed when attempting to gather information, along with the time lag that affects the publication of the limited data provided by the Ministry of Finance and Public Administrations. It is precisely this lack of information that prevents a more detailed analysis, such as the analysis of more precise data provided by provincial offices, subordinated offices and local tax authorities that might enable us to register more than two hundred observations. Regarding the methodology emplo yed, in addition to being particularly widespread in this type of research, we believe that it is a highly useful tool that enables us to drawn important conclusions with regards to public and fiscal policy. 1This study was completed thanks to the support received by the Research Group "Public Sector, Equity, Efficiency, and Management" (SEJ-549). 2However, this interpretation is not without detractors, as the legal standing of AEAT has often been the subject of debate (Sánchez Galiana, 1995), to the extent of denying it a place among public administrations. As Márquez notes (1994: 14), "Tax Agency is not State," whereby "it does not form a part of the Tax Administration." Ferreiro (1991: 401) maintains that "it is technically an autonomous body, which is nevertheless subjected to designs to exclude it from the regulations applicable to such bodies." There are those who suggest that the body's inception represents a move towards decentralization and privatization (Garrido, 1991). 3The current Spanish Constitution of 1978 addresses the division of the State into provinces, stating that [the State] "will be organised, territorially, into municipalities, provinces and into the Autonomous Communities [Autonomous Re gions] that might be established. All of these entities are afforded autonomy for the management of their respective interests." Spain consists of a total of 50 provinces, along with the autonomous cities of Ceuta and Melilla. 4Further details on DEA might be found in Cooper et al. (2007). 5From 2006 onwards, the Central Directorate for Major Taxpayers has been established as a body with powers throughout the national territory, focusing on the coordi nated control of major taxpayers and the improvement of attention and service afforded to them. 6The Autonomous Community of Navarre (formed by a single province: Navarre) and the Basque Country (formed by the provinces of Alava, Gipuzkoa and Biscay) are Autonomous Communities of chartered regime and operate a special system within the Spanish State. 7These offices are also excluded from the sample in the case of González and Miles (2000). 8The number of returns makes reference to the returns resulting from taxes that generate the greatest deal of activity within the AEAT: Personal Income Tax and Company Tax. 9IAL: Ingresos por actos de liquidación. 10AT: Personal Income Tax and Company Tax.